At least 200 melon-head whales flocked to shallow waters of Manila Bay on Tuesday, prompting a massive rescue by hundreds of volunteers and fishermen who used their boats and hands to drive them back to deep seas. The unusual occurrence may have been triggered by a sea quake that could have damaged the whales' eardrums and disoriented them, or the pod could have been following a sick or injured leader, Malcolm Sarmiento, director of the Bureau of Fisheries and Aquatic Resources, said in a telephone interview. He said the whales — between 200 and 300 of them — were spotted about a mile off shore, swimming back and forth between Pilar and Orion townships in Bataan province. Fishermen and villagers trooped to the beach and waded into the chest-deep water, clapping their hands and hitting the surface to drive the whales away. More than 20 boats with their engines shut guided the animals to the open sea. "It's something unusual. 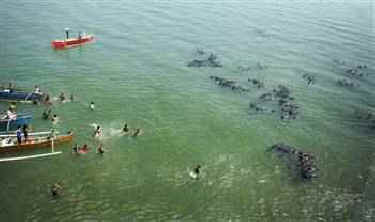 It's the first time that such a large pod has entered Manila Bay, and is acting strangely," Sarmiento said. Alberto Venturina, the provincial veterinarian, said three dead whales found beached farther up north in Abucay township include two adult females, one of which was pregnant, and an infant male. The two adults had damaged eardrums, he added. Another beached whale was in the process of being rescued, Venturina said. Whales with injured eardrums become disoriented, cannot dive for food and are too weak to swim and just flow with the current, he said. If it's a sick leader, the animal needs to be identified and taken out of sight of the rest of the pod so the healthy whales could be prodded back to sea, he said. Fisheries officials were coordinating with private groups and fishermen to stop the whales from being beached and prevent more deaths, he said. Wardens were positioned around the area and fishermen warned not to harm the whales. 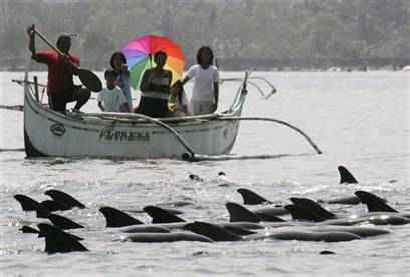 Beached whales are not uncommon in the Philippine archipelago but rarely occur in such big numbers. Melon-head whales are considered threatened species — meaning they are likely to become endangered in the future.